Once we got it together it looks great. However the screws holes aren't aligned and we had to use a power drill in some instances. One of the screws holding the top in place wouldn't go all the way in even with the drill but we just put that end to the wall. Keep your favorite cocktail ingredients at the ready with this multi-purpose serving cart. 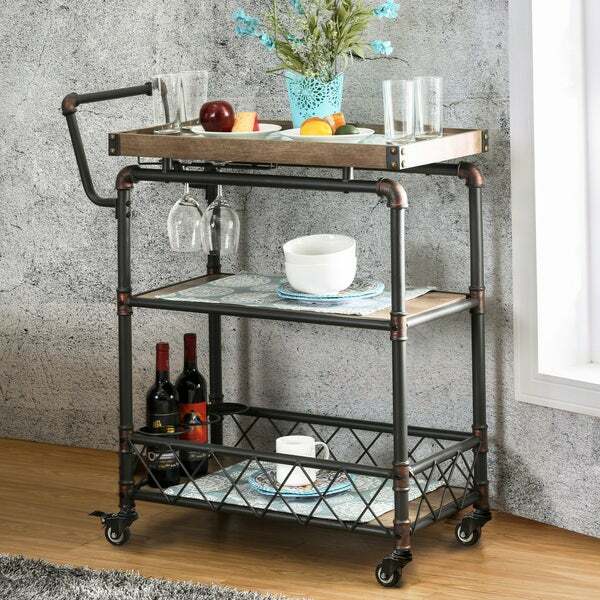 With a sturdy metal frame accented with hand-brushed copper accents for an industrial-inspired look, this cart offers a handy tray-like top, open shelving, stemware racks, and more for organization. I purchased this cart because we needed space for our Nespresso machine, the frother, pods and cups and our wine glasses and our liquor. It fits neatly into a corner of our dining room. The lip on the top shelf keeps things from being pushed off. The bottom shelf is deep enough for holding several beverage bottles and coffee pod supply and the wire around the edge will keep items from slipping or tipping. The shelves are not solid wood, but all of them are very sturdy, and so is the framework. My husband assembled it in about two hours, and had difficulty with one screw. I helped hold the frame while he worked to tighten it, and when he got within a certain distance it tightened as easily as the others. Two of the castors are locking, so you can be sure the cart stays in place. It's appearance is just as the photo. Sturdy, rustic looking cart. I love it! Just as pictured, easy to assemble and sturdy. The two glass racks hold 3 wine or cocktail glasses, and with three shelves, there’s plenty of place to put additional mugs, liquor, etc. I ended up taking the handle off but it looks great with or without it. Love this purchase! I searched the web several times for the perfect serving cart, and I certainly found it at overstock. It is extremely study and was fairly easy for a woman to put together. I love the industrial look and it looks great in my modern dining room. I love the free shipping always a big bonus. I love the solid "pipes" this is a very sturdy cart. Most bar carts we looked at only had two shelves and those that had three werent big enough to fit and hang wine glasses. This one is perfect! The small additional details around the bottom really add to the overall look. 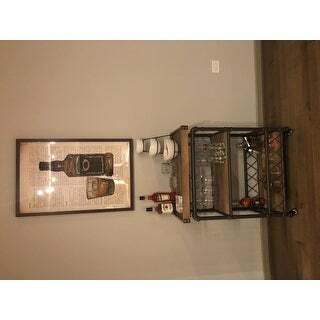 This bar cart fits so well with our decor, we couldn't be happier! Love this! This was one of the first items that we assembled in our new home, and it is used constantly. It's very heavy, sturdy, and attractive. Love the wine glass racks! The cart looked fantastic and rolled nicely whenever I wanted to move it around. Got lots of compliments on it every time we had guests over, and it made an excellent Old Fashioned station. My only complaint is that the particle-board-like "wood" was cheap and holes didn't line up correctly, so one of the screws didn't fit to hold the shelving in place. While this wasn't truly an issue, it does take away from the quality a bit, so it gets 4 stars instead of 5. Assembly was relatively easy, and pictures definitely helped. Would purchase again if on sale for under $200. Would make an excellent addition to my new apartment. This has a great industrial look and style. It went together fairly easily but, as with many of these items that must be put together, the holes on the shelves didn’t line up. Other than that the hardware pieces are in separated packages and are nice quality. I am very pleased with this purchase and have already gotten compliments on it. Very nice and my handy-challenged husband had no problem putting it together. I use it to set papers and wine bottles on whenever I have a small group gathering. Time to put together. However, it is a truly unique looking cart. Goes with any decor. Easy to move. Love, love, love it! This bar cart arrived early. We love it. Well made. Very sturdy. Surpassed our expectations. Love Overstock. "Can the towel rack be omitted when building? If so, what is the width of the cart without the towel rack? Thank You."